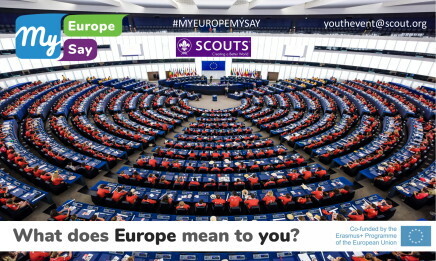 The European Scout Region of the World Organization of the Scout Movement (WOSM) and its partners in the “My Europe, My Say!” project are inviting interested members of National Scout Organisations and Associations (NSOs/NSAs) and AEGEE local organisations to join two youth events, happening at the same time and focussing on “Multiculturalism and European Citizenship”and “Europe and Me: Understand, Mobilise, Act!” organised in Morbecque and Strasbourg between 16-22 February 2019 by the European Scout Region, Scouts et Guides de France (SGDF) and Eclaireuses Eclaireurs de France (EEDF). The youth events will offer a 5-day intensive insight into the importance of youth participation in Europe with a side focus on the upcoming European Elections 2019. The five-day events will gather participants who want to learn about European politics and processes. Participants will create an action plan that they can implement in their local Scout group and with their peers to mobilise young people around youth participation issues. The events are co-funded by the Erasmus+ programme of the European Union. => Find out all relevant details about this Call for Participants in Regional Circular 38 2018!